After running a few errands we went out to the canal for a walk. I was hoping to find some ducklings to shoot pictures of, but instead was rewarded with 8-10 families of Canada Geese. I kept a quiet and respectful distance- the river was running high and fast and I did not want to startle them. 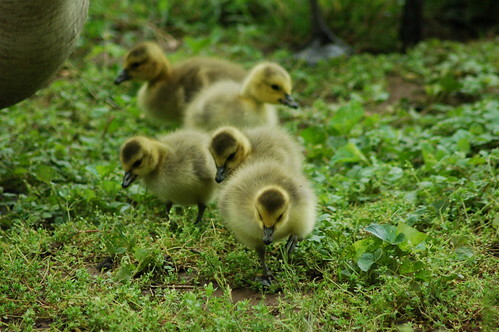 A water exit would prove hazardous and exhausting for the goslings. It was an overcast day, so I ended up with a lot of blurry shots. Long exposure, long focal length, and trying to focus on a bunch of fuzzy objects led to some less-than-spectacular yet still cute results.